I am a first time dog mom to a Golden Retriever, and I would have never thought I could love a dog so much as I do Ellie. I have always loved dogs and other animals, and growing up my family always had a dog and a cat as a pet that I cared for and loved, but it isn’t the same as having a dog of your own. 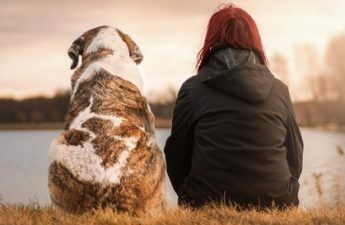 The love and bond that dog owners have with their pets is like no other, but what about dogs, do they love their owners? We all know that dogs are loyal and loving towards their owners, and are considered man’s best friend ( and woman’s) but they will show their love towards us in some obvious ways, and sometimes not so obvious ways. Find out the 12 tell tail signs to look for to confirm your dogs love towards you. A sure way to know your dog loves you is when they look into your eyes. Eye contact with your dog creates a deep bond, in fact when your dog looks at you they release a hormone called oxytocin, which is the same hormone that helps new mothers bond with their babies. When humans make eye contact with each other, it is to show that they are engaged and interested in what the other person is saying, but when dogs lock eyes with another dog it is often a sign of a challenge or aggressiveness. When a dog stares at their favorite humans, it is usually out of love. Next time you and your dog lock eyes with each other, pay attention to your dogs eyes, if you see little to no white in their eyes it means your dog is relaxed, and happy and comfortable with you. Yawning is contagious right? Just writing about yawning is making me yawn. Yawning isn’t just a contagious impulse to humans, dogs have been shown to echo a yawn after their owners. Dogs are more likely to yawn when their owner yawns than when a stranger yawns. Research indicates that when humans yawn after another human yawns it is a sign of empathy, so it is likely that a dog yawns after their human does it for the same reason. It is one of the signs that they are bonded with you and love you. When I am away from my dog for an hour or several hours, it doesn’t matter the length of time, I am always welcomed home by an excited, tail wagging, happy to see me dog. It is one of the joys of dog ownership, being greeted by your dog. Dogs are excited to see their humans after they have been away from them and will display their excitement with tail wags, running, jumping, and licking their owners face. It is their way of showing that they are happy you are home and it is a demonstration of love. When your dog brings you their favorite toy, they are wanting to play. Dogs can be very possessive of their toys and when they bring you their favorite, it shows that they trust you and love you and want to engage in some play time. Their favorite toy makes them happy and they want to share their happiness with you, they think that you will love their toy as much as they do. Sharing is caring, and it is their way of showing affection. There are a few reasons that dogs lean against you, it could be because they are afraid and like to be comforted by the fact that you are there to protect them, or it could be because they are claiming you as their human when other dogs are around, and are trying to protect you. Either way when your dog leans against you it is a sign of affection, they think of you as their protector. Think of it as a doggy hug. Your dog wants to lean against you to give you attention, and is hoping you return the favor by petting and giving ear rubs. When your dog sleeps next to you it is a sign of affection. Dogs are pack animals and want to be close to their pack to feel safe and secure. Your dog sees you as the pack leader and feels the most comfortable and safest around you. When you see a litter of puppies, you see that they all snuggle up and sleep on a pile of each other to feel safe and comfortable. It is in their nature, and your dog wants to replicate that feeling of warmth and coziness with you. When dogs lick their owners their brain releases happy hormones called endorphins, which makes them feel calm and secure. Dogs also lick their owners because they like the taste of their skin. Licking is a natural instinct in a dog to groom themselves, and by licking you they are showing you that they love you enough, and want to take care of you by cleaning you. Just like a mother dog does to its puppies. Wherever you go your dog follows you, even to the bathroom you are not alone. Your dog becomes your shadow. To your dog you are the whole world, and your dog is showing love by wanting to be around you at all times. Dogs are social animals and want to be with their pack. They feel happiest when they are around the people they love. Dogs enjoy human companionship, and would rather be with you than be left alone. Showing jealousy is not only a human characteristic, but it can happen in dogs as well. Jealousy is not a great feature but it shows that your dog sees you as his own, and does not want anyone or any other dog to come between you. A dog may interject between you and another dog if they see you petting, or showing any other dog attention. Your attention, your affection, and the sound of your voice are all to be prized, and your dog wants that prize all to himself. Jealousy can be a cute form of affection towards you, but when it gets out of hand it can be a problem that needs to be corrected. Watch out for any signs of aggressive behavior. It is human nature to protect the ones we love, and dogs will do the same. They will bark at anyone that approaches their favorite human, in a way of protecting you and keeping you safe. Over time the bond that forms between you and your dog will get stronger and your dog will be part of the family. Your dog will see you as family and it is in your dogs instincts to want to protect the ones he loves. 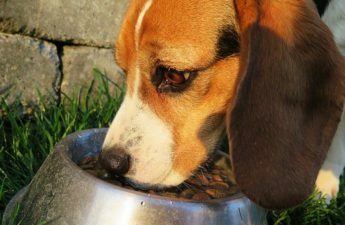 Showing signs of protection towards you is a way that owners can feel loved by their dogs, but never allow your dog to become over-protective, as this can lead to problems in the future. When you are feeling sick, it is your dogs natural instinct to care for you. They may recognize the signs that you are not feeling like your old self and may want to lay next to you and comfort you. If you have a wound on your body they may even try to lick it better. When you see dogs playing together, it usually looks like a form of wrestling and can look pretty intense. They will jump on each other, and pin each other to the ground, this type of play is their favorite as it allows them to let off steam, and have fun. They usually play this way with a dog that they trust, and feel comfortable with, a true friend. When your dog wants to initiate this form of playing with you, it is a sign that they trust you and are comfortable around you, it is a great compliment. They see you as being fun to be around and it is their way of showing affection. It is easy for us humans to show our dogs love, by rubbing their bellies, giving them treats, taking them for walks and showing affection, but the way our dogs feel about us is shown in many ways. When we see any of the signs mentioned above we know that our dogs feel the same way about us. All dogs are different and may have other ways that show their owners they love them. One thing is for certain, if you show your dog love and affection, it will be returned to you. There is no greater feeling than the love of a dog. Are there any other ways that your dog shows their love for you? I would love to hear from you, please leave a comment at the bottom. Thank you for highlighting the traits of dogs and how they show their affection. Now that I have read what they are I can see a lot of these things with my dog. It’s really cute! I definitely did not know about the dog on dog eye contact and I will watch for that as a just to be safe. Thank you for your comment Kahlua. There are many subtle ways dogs will show their love. Keep an eye out for them, and you’ll be reassured of their love. Good post! My dog, Athena, has been through some rough patches lately. We moved about a year ago to a completely different town and out of a house into an apartment. We lost our other dog to a sudden health problem right when we moved so she lost her companion as well. Also, she has had to adjust to a new baby too. She used to be my dog and with the baby taking up so much of my time, she has started following my husband around since he can give her more attention. I miss the connection we had and was beginning to wonder if she didn’t care for me anymore. I know that sounds a little dumb but it’s true! I read your post and she still does quite a bit of these behaviors so I feel a little better about it. Thanks for sharing! Maybe in time, we can be the pals we used to be. Hi Tina, thanks for your comment. It is nice to hear that your dog shows these signs to you. I am sure in time you will be able to have that close bond with your dog again.